"What’s the Point If We Can’t Have Fun?" by David Graeber in the Baffler is an interesting philosophical sketch of how play might be one of the fundamental forces of the universe. I like that idea! 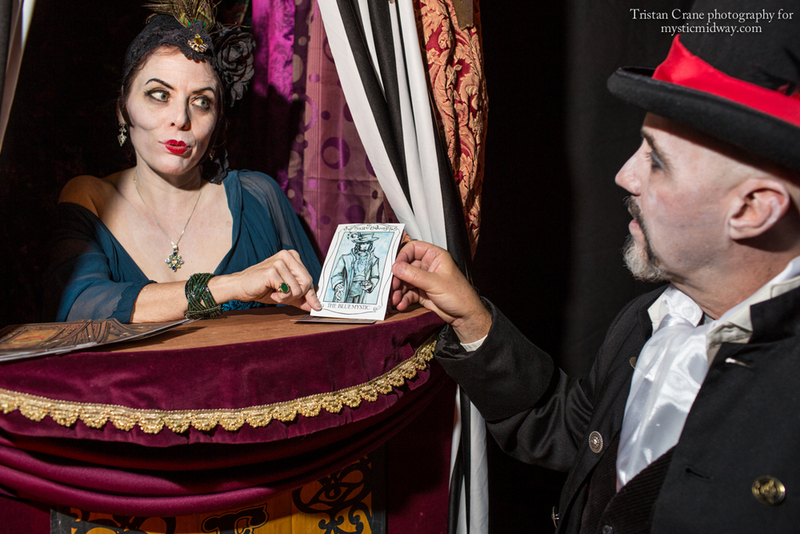 After the highly successful "One Terrible Magical Thing" location performance at the San Francisco Edwardian Ball, The Mystic Midway was asked by the Edwardian Ball to create another ambient game environment for their annual Hollywood event. 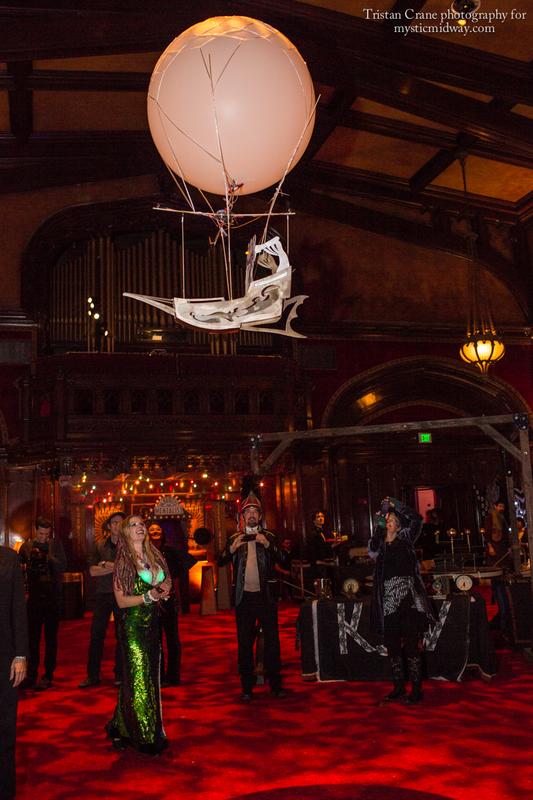 A beautiful look at what the MM created at Edwardian Ball 2014! On January 17th and 18th the Mystic Midway created a live game environment in the Masonic Lodge Theater of the Regency Center in San Francisco. The Mystic Midway is an ongoing transmedia project created and managed by Scott Levkoff (http://baronscottlevkoff.com). Our goal was to engage the audience's imagination and participation who wandered through the event space, and we succeeded beyond our wildest expectations. Myself and Mr. Levkoff designed a simple game experience that could be completed in 15-20 minutes or so by interacting with the walkaround characters who were present in the Mystic Midway space. 15-20 characters, Two tents and five freestanding attractions defined the space, which was embedded in about 1/3 of the floorspace of the Masonic Theater area on the top floor of the Regency. The fundamental goal was to have a simple storyline that was flexible enough to intrigue but not intimidate slightly tipsy patrons while creating a space for people to share deeply personal stories with the troupe of performers. The publicized theme of the Mystic Midway event was "the Magical Terrible Thing," a homage to Edward Gorey style ersatz humor. We often draw inspiration from archetypal folklore and symbology systems like alchemy, tarot, Freemasonry, etc. After much discussion, we decided to cast the audience as heroes in a quest to find out something magical about themselves and something terrible about themselves, then combine these things conceptually into the Philosopher's Stone and be granted a wish as their reward. Functionally, this meant we needed a cast of Mystic Midway denizens who could wander about or remain in an enclosed stage and interact with people to draw out their personal stories, and a way to mark participants as they moved through the quest. We hit on the idea of stamping the left hand and right hand for finding their the terrible and magical things, respectively, keeping with the archetypal notion of left- and right- hand paths of initiation. Our meta-game structure decided, we proceeded to find the talent to fill out the cast and determine the various characters who would be leading the audience through the experience. Troupes of thematically coordinated characters were assembled and co-created their personas, lines and goals with Director Levkoff. All were themed to be relatively gloomy and dark sense of humor in keeping with the overall tone of The Edwardian Ball. Hobo King was the first stop on the quest for a Terrible Magical Thing. Fairies focused mainly on the magical stories from the audience. Harlequins focused on the terrible things the audience would reveal. Fortunetelling booths offered a reading using a Mystic Midway themed tarot-like deck of cards to prompt and inspire audience members to reveal their Magical/Terrible things. This deck contains the characters who were actually portrayed by real actors in the space! Lady Fortuna reveals the fate that lies within the cards. A covered stage that contained the land of the fairies, The Ecstatic Emerald Effulgent, had the Fairy Queen and Mermaids engaging more intimately with patrons to draw out their Magical or Terrible secrets. Within the Ecstatic Emerald Effulgent, The Fairy Queen awaits those who seek her wisdom... or wrath. A miniature version of the Mystic Midway, within the Mystic Midway. The climax to the experience occurred with a magic show presented by The Alchemist in the Miraculum tent themed to the alchemical process, combining the magical and terrible into the gold of illumination. Audience members were given a small gemstone or trinket to commemorate their experience. Finally, an audience member who had completed the entire quest was directed to the Airship Wonder and her crew. This group needed the wishes of initiated folks to power the flight of their airship. Upon showing proof of their illumination, they would have their names and wish recorded into the Wonder Manifest by the crew. Every so often the airship (a helium balloon remote-controlled drone) would take flight around the space, providing a very public payoff to those who made the effort to complete the quest. The Wonder in her berth, crew ready to take the name and wish of the initiated into the Wonder Manifest logbook. The cast's skilled listening and empathic nature created a sense of trust in the guests - thus eliciting deep sharing. In conclusion, "One Terrible Magical Thing" was a highly successful experience for all involved, marking a new level of live event production quality, technological innovation and game design accessibility. The Mystic Midway will manifest again and I can't wait! Huge thanks are due to the Mystic Midway cast and crew, and to the producers and staff of the Edwardian Ball. 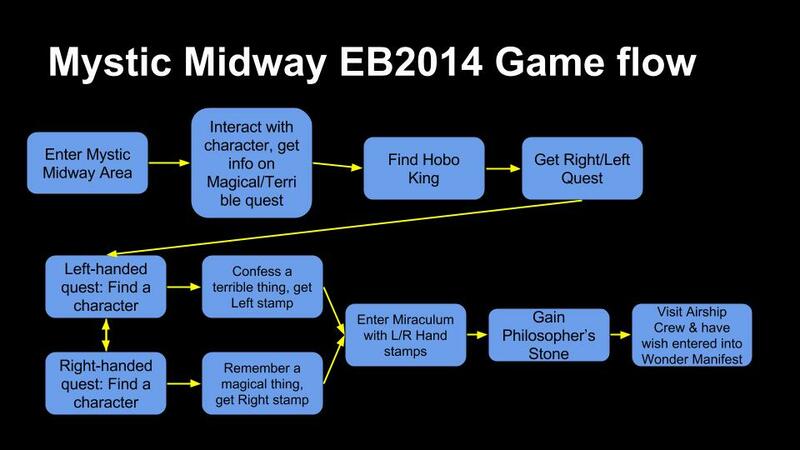 I co-designed a live game for the Mystic Midway at the upcoming Edwardian Ball, January 17-18 2014 called "One Terrible Magical Thing." Details will follow the week after, but as you can see from the flyer below, it's an epic quest involving 5 locations, an ancient Masonic Lodge Theater, and 30 performers! Happy Holidays from The Ludologist! Behold! The traditional The Ludologist Lovecraftian holiday card for 2013!